It's rare to see a band release a more confident and sure first album than Starcrawler has. Not only that, but it's incredible to think that in a band where the oldest member is twenty-one, there's this real love and understanding of rock with sprinklings of glam production, 90s indie cynicism, and some real bad-vibes psychedelia. 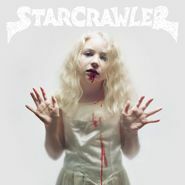 Starcrawler is a real heavy headbanger that seems pissed off about the influx of modern soft rockers and delivers shredding guitars and stoic, tough vocals along with it. Henri Cash's guitar parts are solid clean and catchy, Tim Franco's bass rhythm trots and marches with some pure Black Sabbath thudding, and Austin Smith tears into those drums, but there's no way to not bring up Arrow de Wilde's stage presence. She's like a teenage version of Stooges-era Iggy Pop with her ferocious and wild stylings. She channels this Bowie-ish vocal style at times, but her insane and frenetic movement makes her look like she's being exorcised on stage (complete with body distortion!). But this isn't to distract from the tunes themselves! Though "I Love LA" shares its title with the Randy Newman song that's played a dozen times at each Dodgers game, Starcrawler's tune seems to be a song about social disconnect in Los Angeles. Each thought and passage seems like a question without an answer that then quickly jumps into a chorus that feels exhausted and even bitter about Los Angeles. Plus there's a beautiful freak-out solo half-way through the track that temporarily spirals into hypnotic bliss. "Let Her Be" owes a bit to T. Rex and dense glam rock production. But then toward the finale, the song gets warped into outer space for a brief moment with some distorted and waning sounds that could've come right out of a 70s Hawkwind album. Starcrawler's debut is a lesson for anyone who thinks they want to start a band. One listen to this, and it's like the perfect reexamination of rock to start off 2018, with pure, unpretentious simplicity and most importantly: fun.